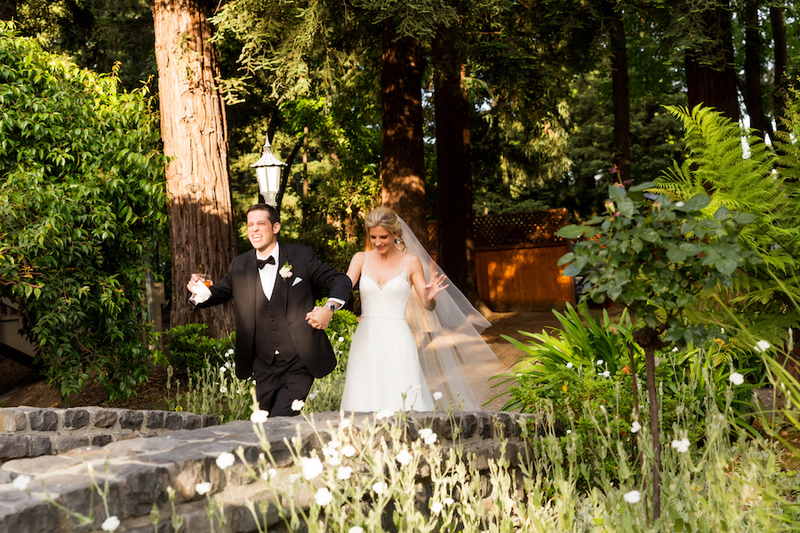 Stephanie + Amour were wed on May 19 in beautiful St. Helena, CA at Harvest Inn by Charlie Palmer. 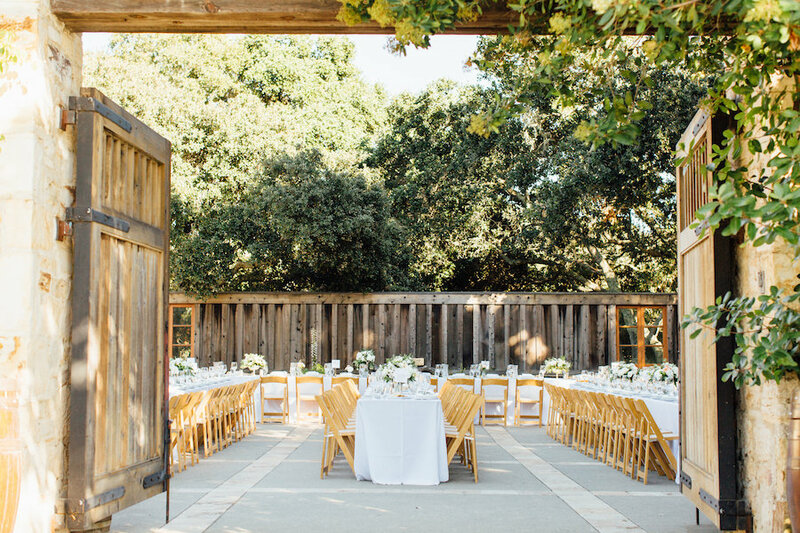 Authentic, organic and elegant, the venue offers nature at its sophisticated best: abundant vineyards, rolling lawns, and blooming botanical gardens set against the majestic backdrop of the Mayacamas Mountains. 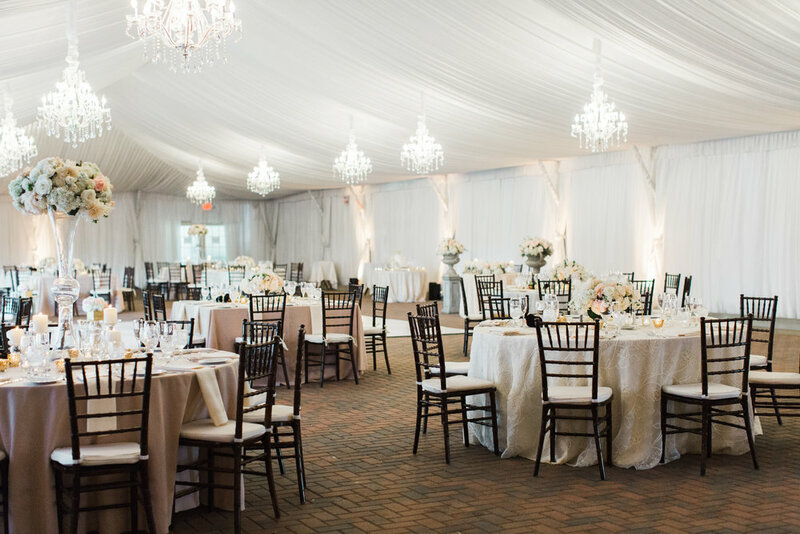 The couple wanted to plan and design their own wedding day, but hired ROQUE for ongoing access to our vendor referrals and detailed assistance with all elements related to design and decor along with day of coordination. 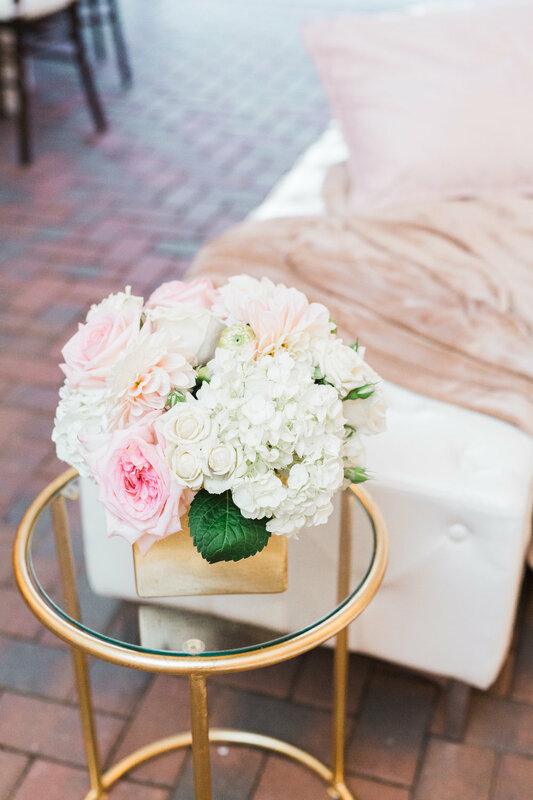 The organic and chic theme based off the natural beauty of the venue, featured a color palette of pink, yellow, cream and sky blue. 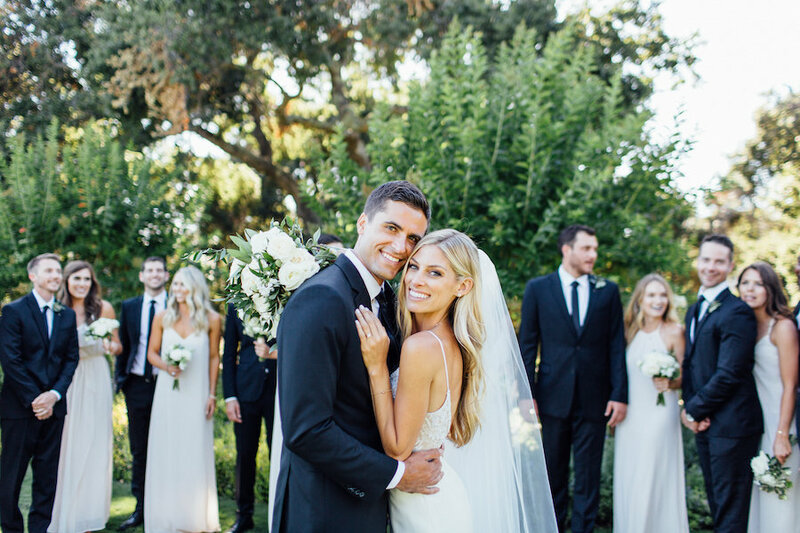 A simple yet sophisticated ceremony was perfect for the couple. 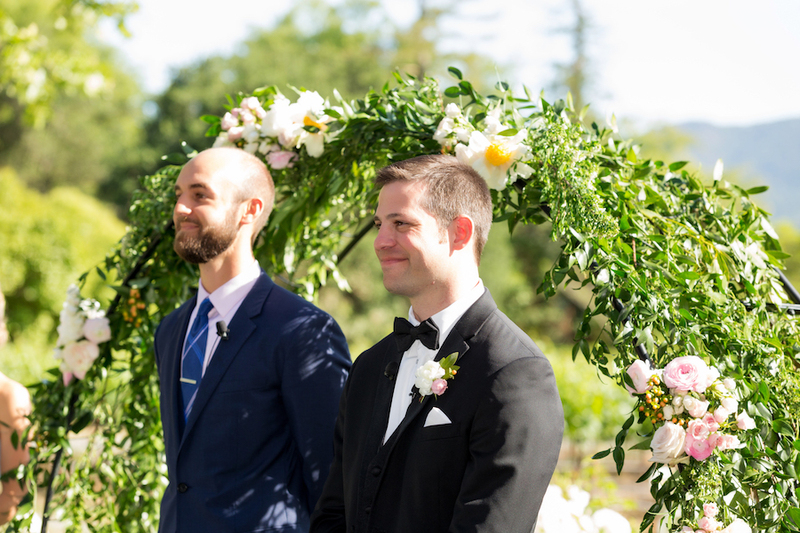 A gorgeous floral arch by Mae Flowers was the focal point with beautiful petals on the aisle. 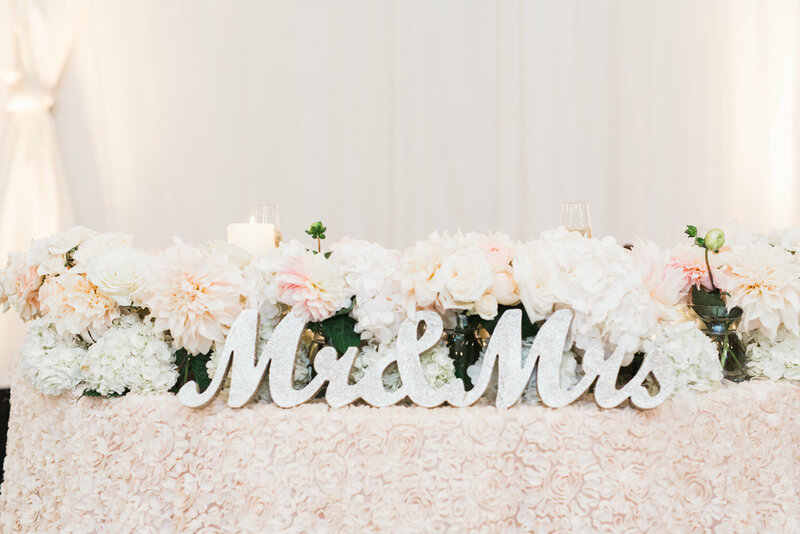 White chairs really allowed the florals and details to pop. 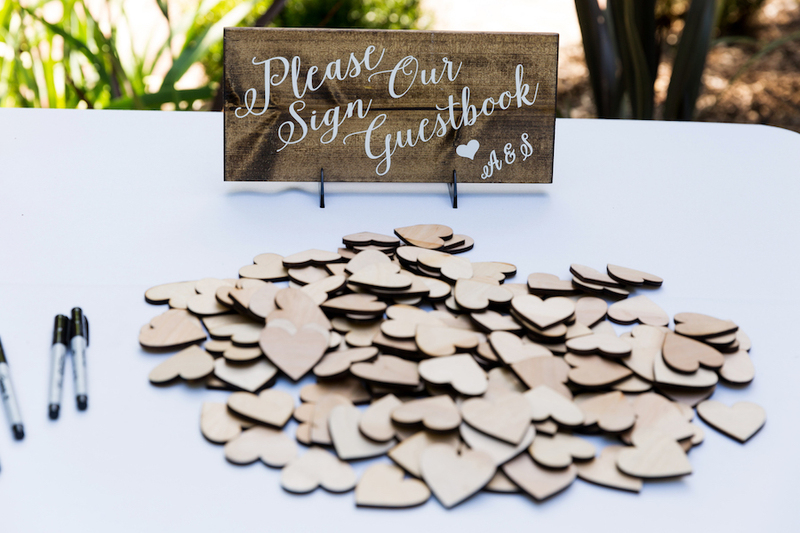 We loved S + A’s unique guestbook where couples wrote a message on wooden hearts and then placed them in a glass frame the couple could keep forever. 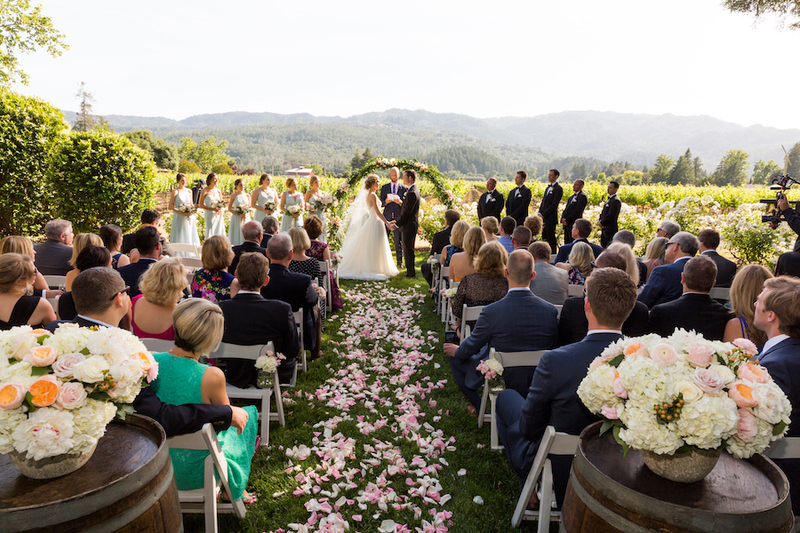 Guests entered the reception with the picturesque mountains behind them, which allowed the organic design to shine. 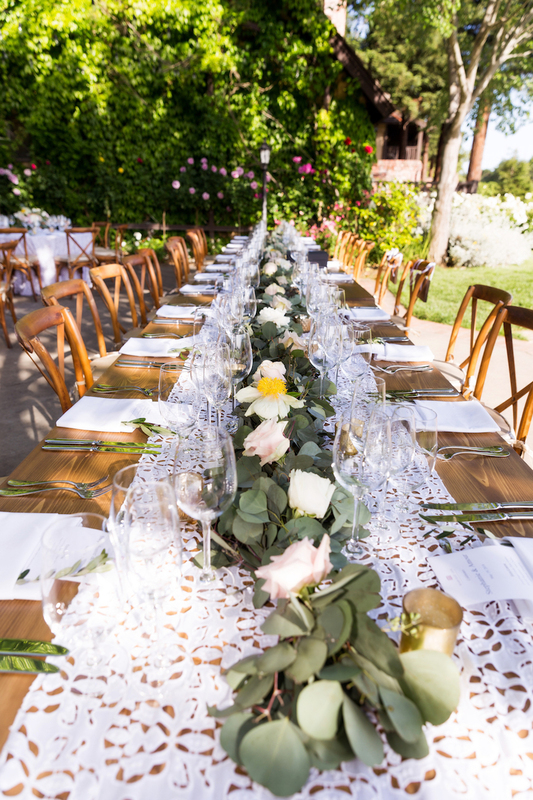 Guests dined at round tables beautifully lined with a beautiful linen from La Tavola. The design followed through with that same linen as a runner for the head table with a greenery runner also on top. 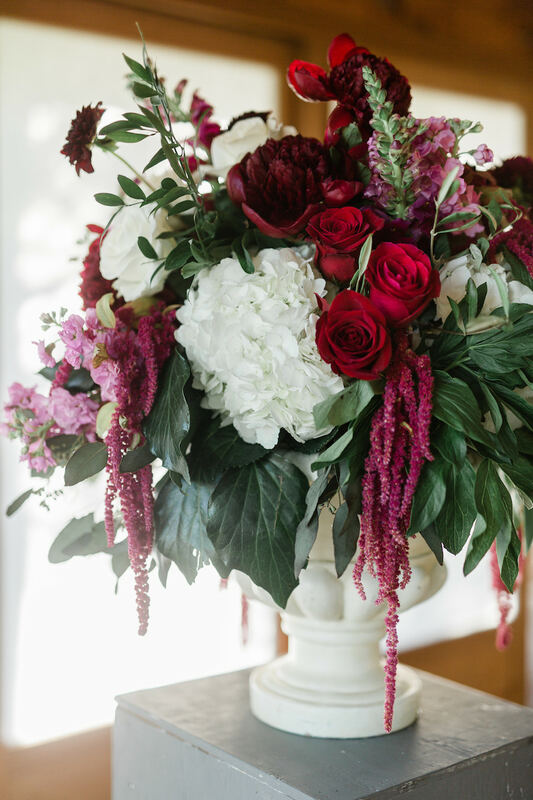 Beautiful floral arrangements placed at each table provided the perfect pop of color. 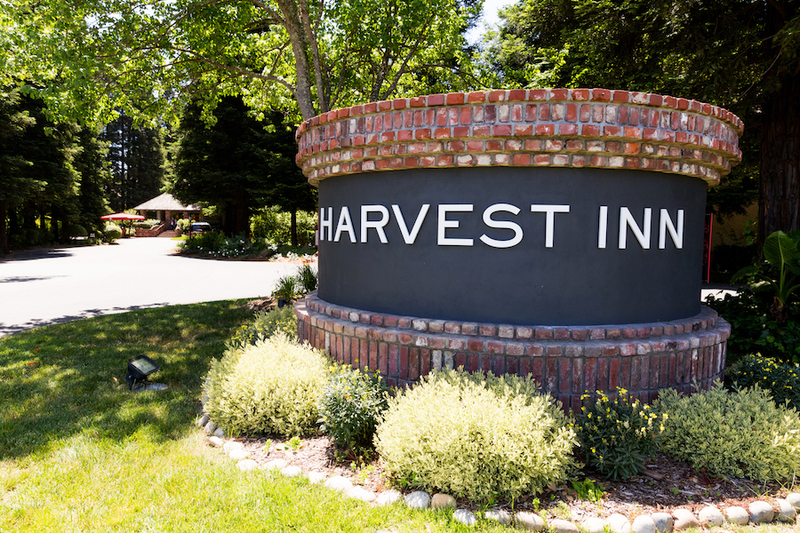 Harvest Inn created a delicious dinner menu for all the guests before they danced all night long to sounds by DJ Sir Edgar. 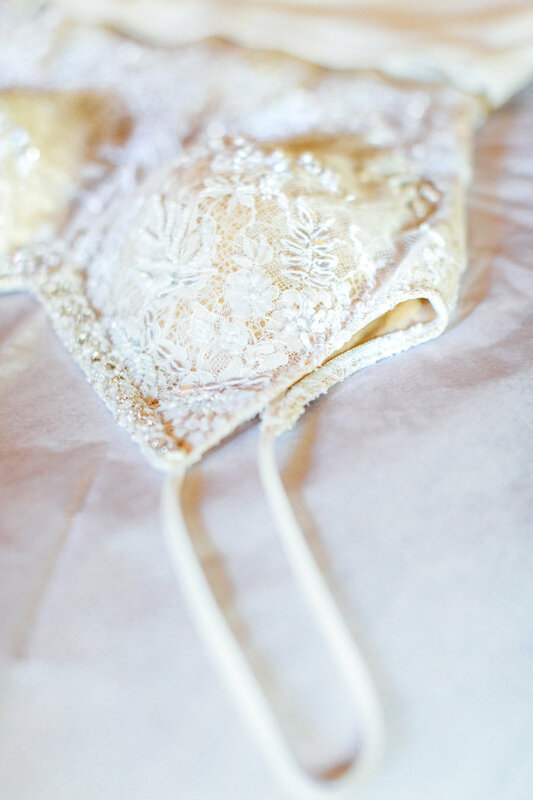 Click HERE to see the full wedding featured on ZOLA. 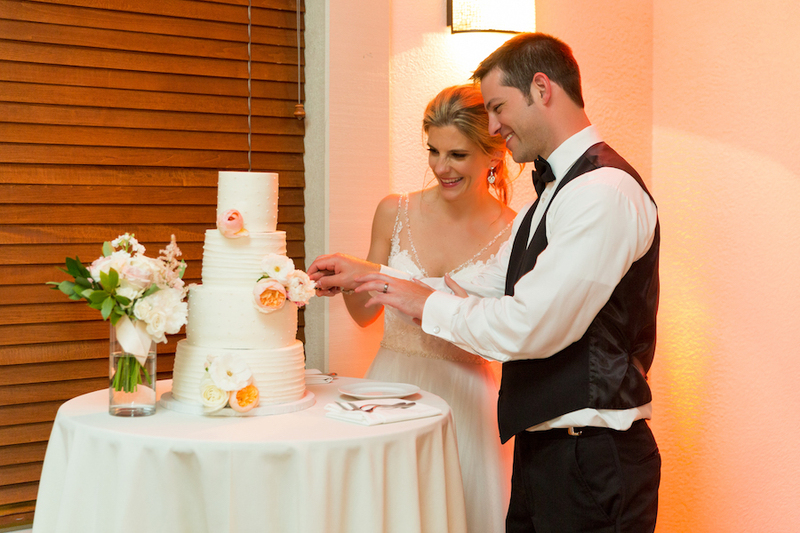 From the decor, food to details, we designed Kacey + Shane's dream Italian-inspired wedding. 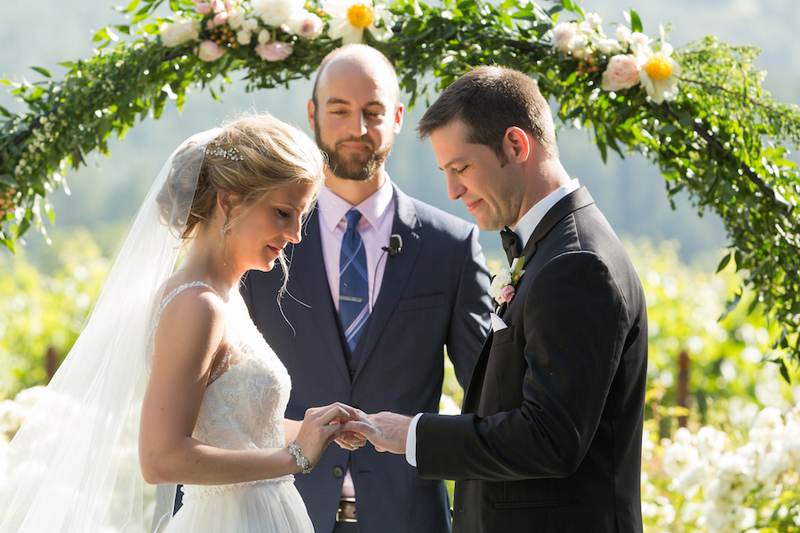 The couple spends a lot of time outdoors, so they wanted their wedding to feel like a big summer celebration under the stars. 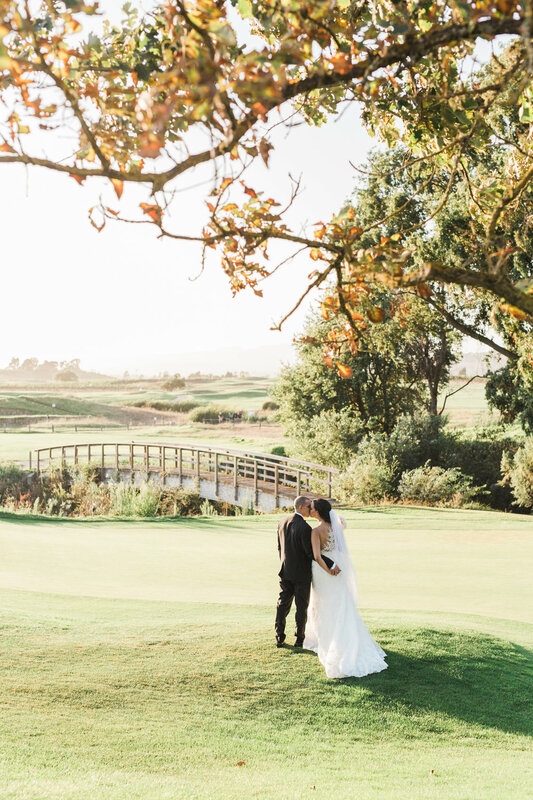 They chose Holman Ranch in Carmel Valley for their venue because of its natural beauty, reminiscent of an Italian villa. 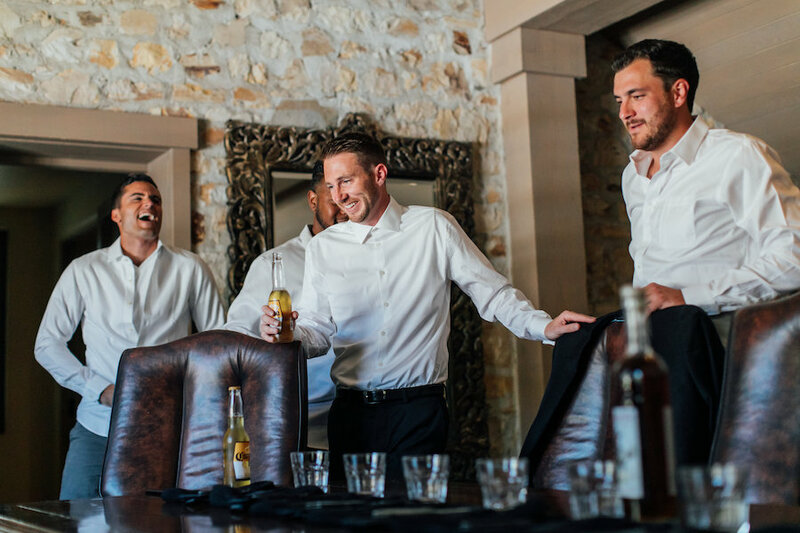 The venue also offers casitas where Kacey + Shane’s entire wedding party was able to stay, along with fun amenities including bocce ball, a pool, and fire pits. 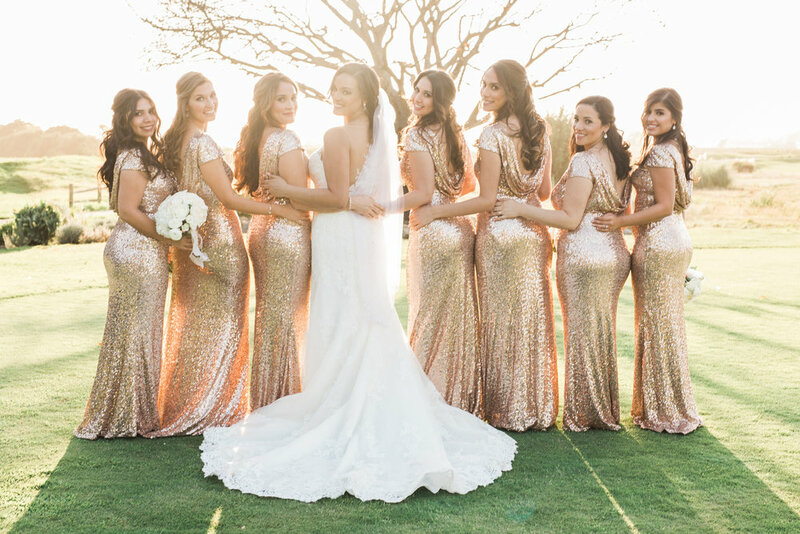 The couple really wanted to show how important their friends + family are to them and having the wedding party stay at the venue was the perfect way to do this. 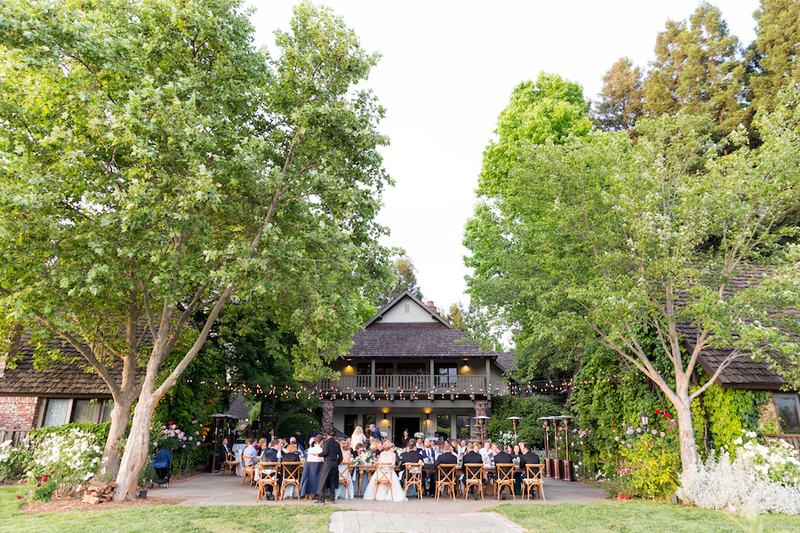 Guests loved the farm table seating and open reception the property offered. 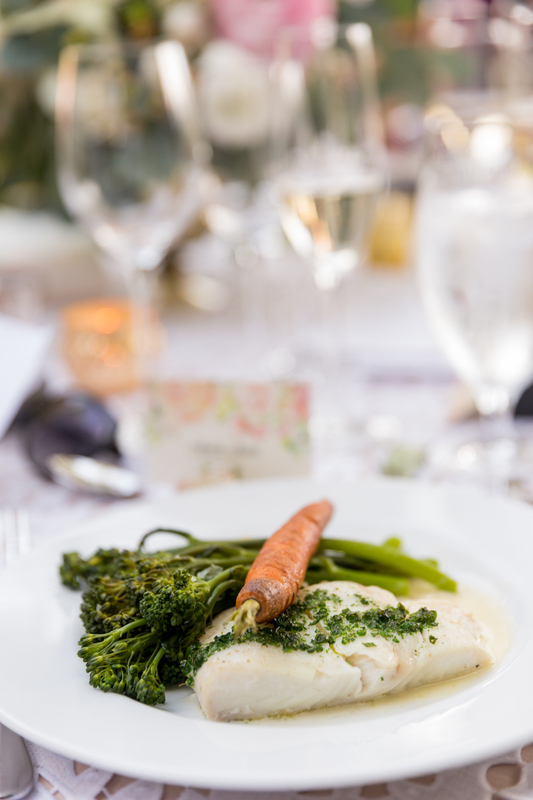 To keep with the intimate affair, the reception included an organic farm-to-table menu by Paradise Catering served family style. 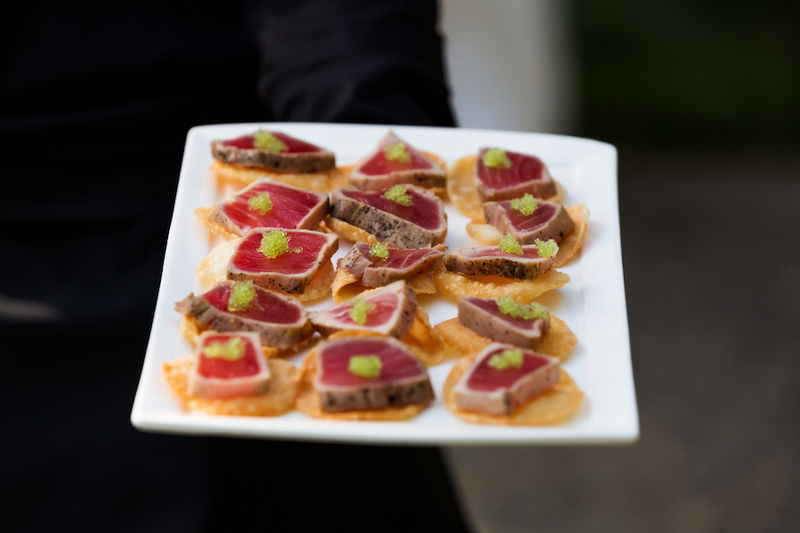 With a growing garden in Carmel Valley, Paradise Catering curates organic menus influenced by what is fresh, in season, and sources from local companies, if not their garden. This was very important to Kacey + Shane. 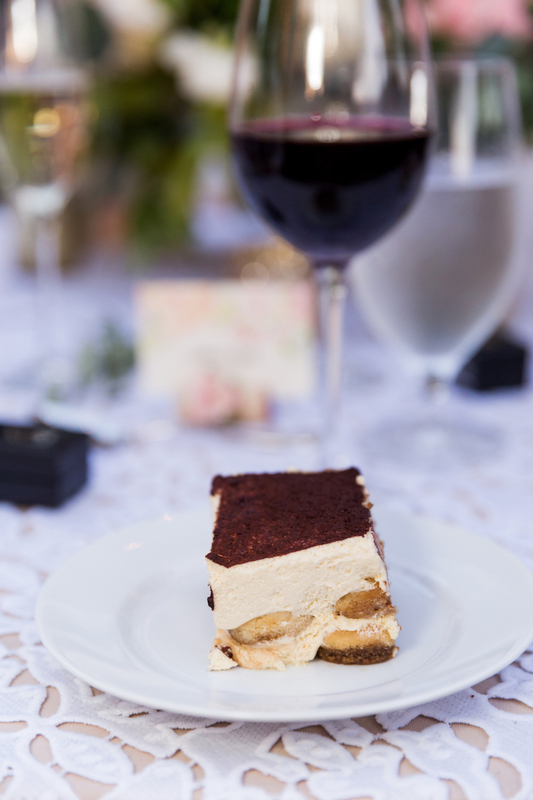 Guests enjoyed the flavorful and local selections! 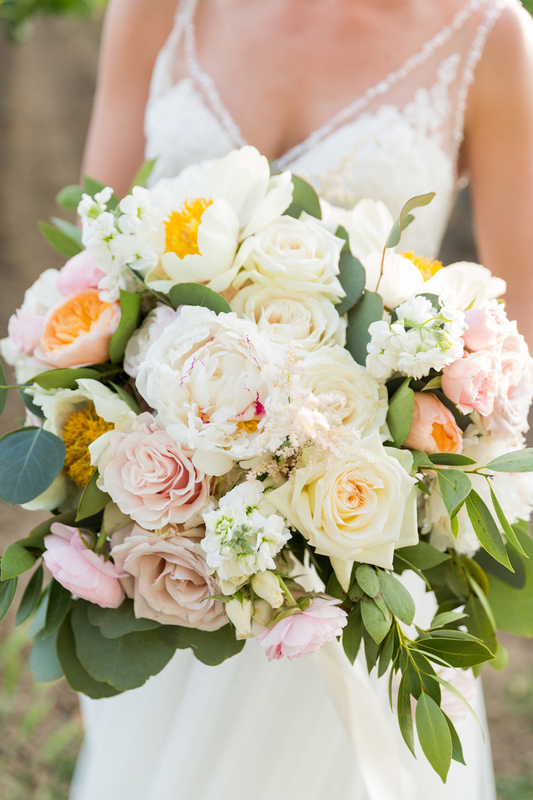 To create the organic and fresh design, we used a simple ivory color palette. 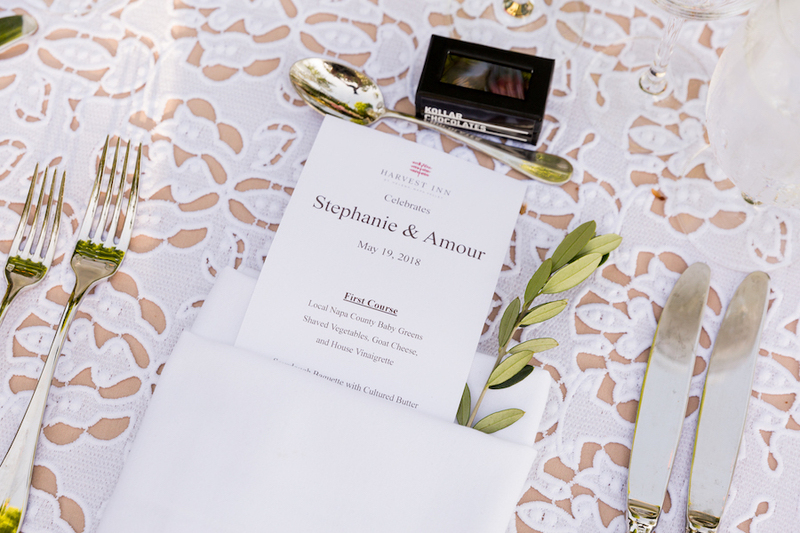 Olive branches were placed at each place setting and a pop of greenery was added throughout the table arrangements. 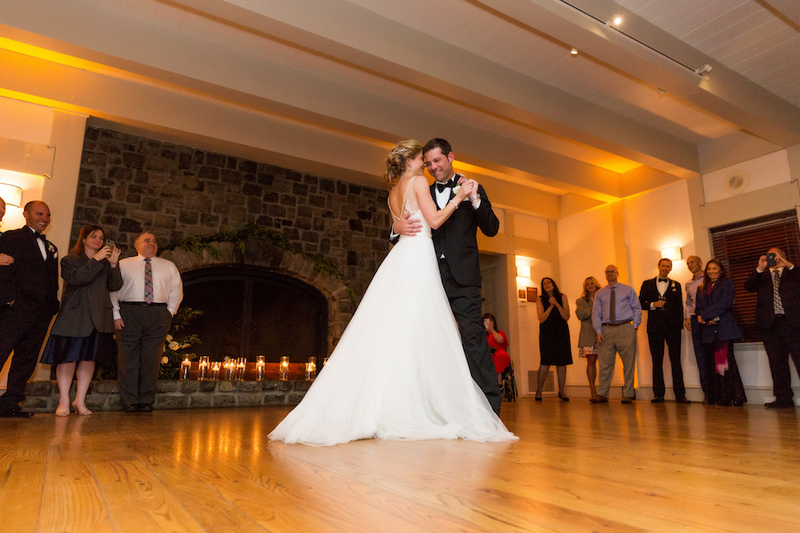 After dinner, guests danced the night away to celebrate the beautiful couple. 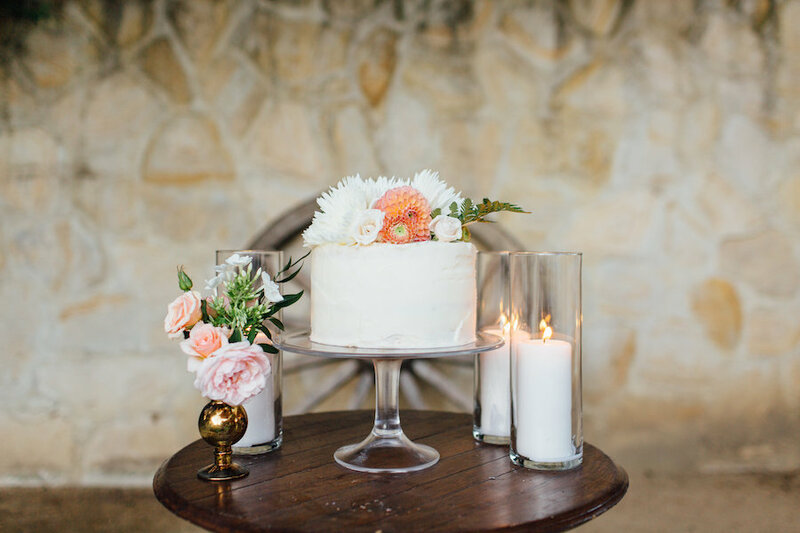 Click HERE to see the full feature on Carats & Cake. 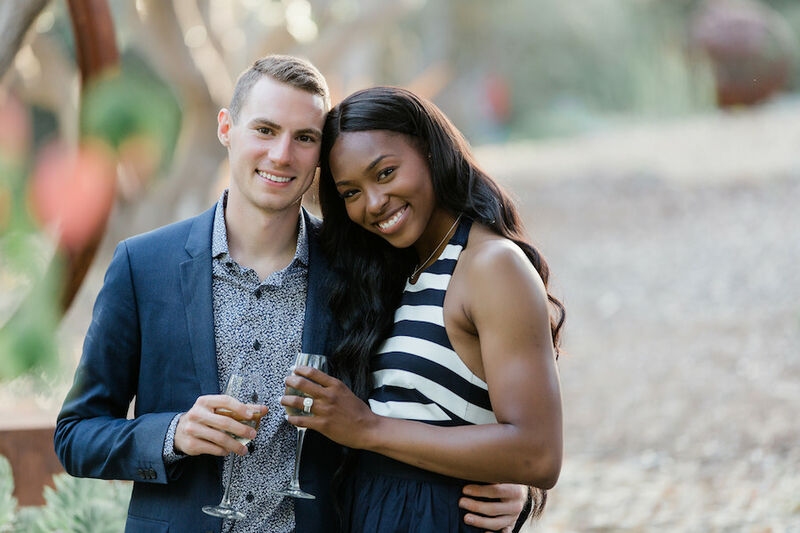 We had the pleasure of working with not one, but two Olympic athletes on their amazing Napa Valley engagement! 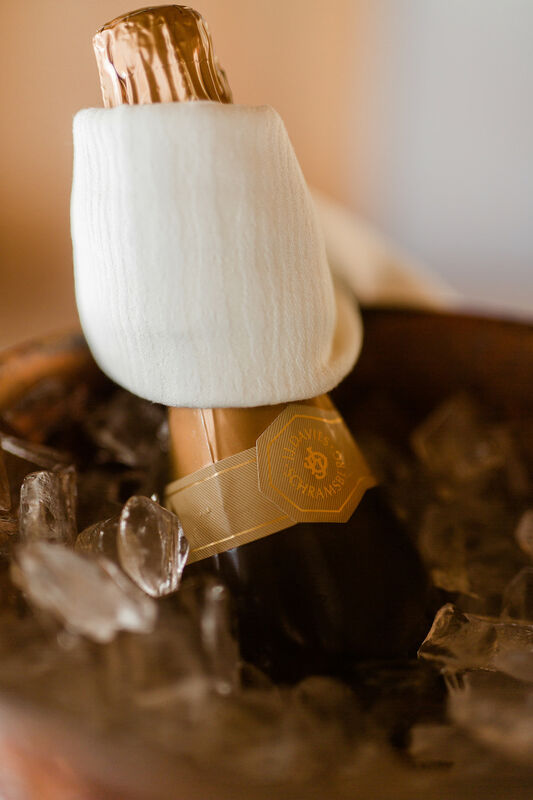 Thank you to our team of vendors who pulled off this perfect proposal! 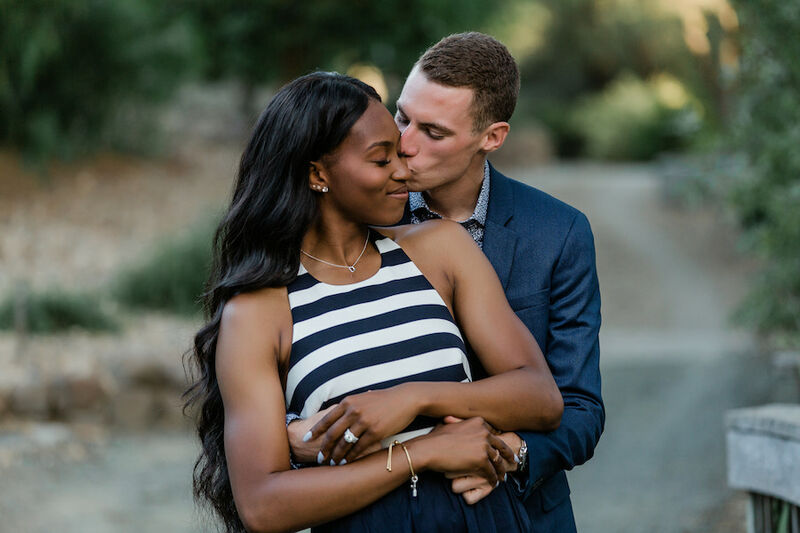 We are excited to work with Ariana + Clayton again as we coordinate and design their luxurious wedding set for December 2019. If you are interested in learning about our Proposal package, please click HERE. One night at the 2016 Rio Olympics, Ari and a few other athletes were playing Uno and I joined in to play. I’m pretty sure she probably beat me and however they were playing with slightly different rules than I was use to in my defense. Ari and I hung out a few times in the village with our friends getting McDonald’s or enjoying the Rio nightlife post competition with other track athletes. Following Rio we stayed in touch as friends until the day came when we decided to start dating. 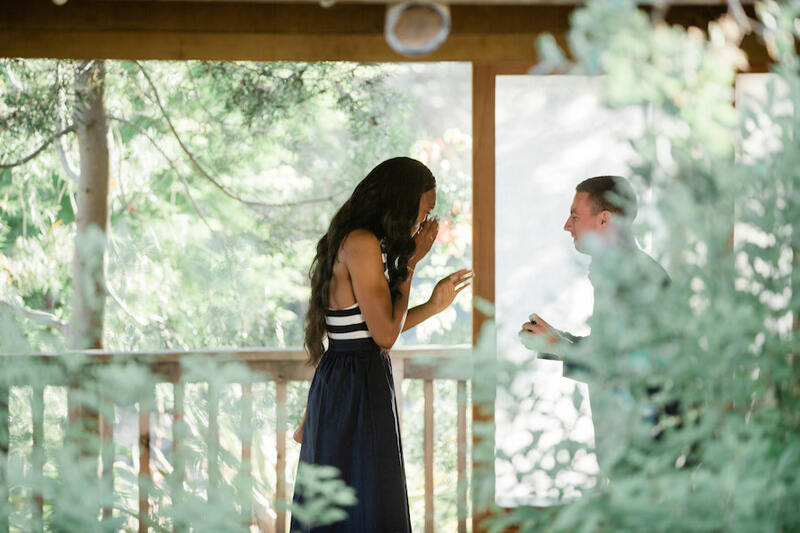 Proposing to Ari for me was a challenge for me as we had discussed marriage, dates, location, and even hired ROQUE Events as our wedding planner. So she really knew it was coming and began asking me on a regular basis trying to get me to slip when I may do it. 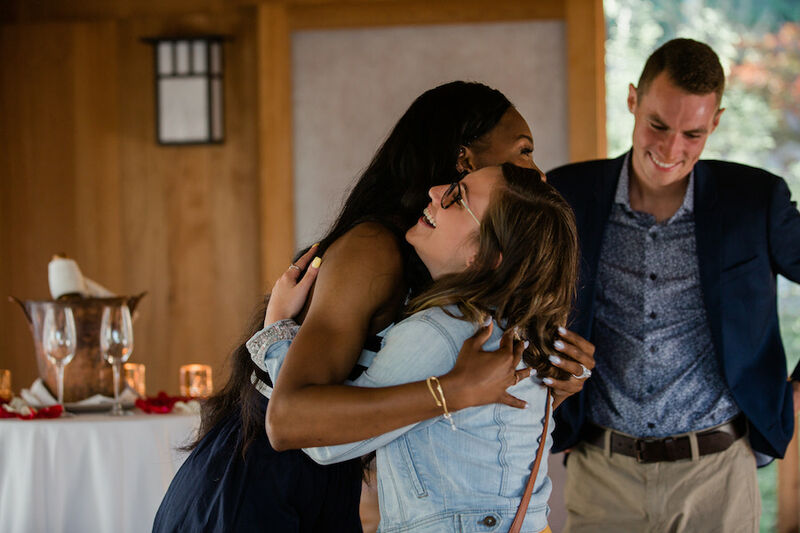 However, with the help of ROQUE Events, our family and closest friends I was able to pull of a complete surprise of a proposal. It was about 5 weeks in the making from the day the plan originated, and I had to stick to my story for 5 weeks that I had no time to shop for a ring and that I wanted to really make it perfect so with my travel schedule I was really unable to put in the time I wanted to. 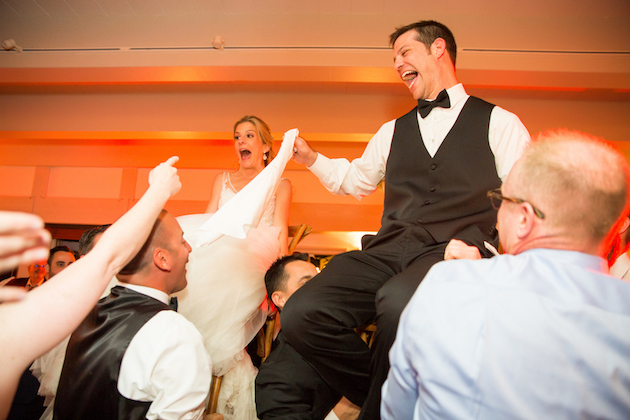 Ari completely bought this story up until the minute I got onto one knee. 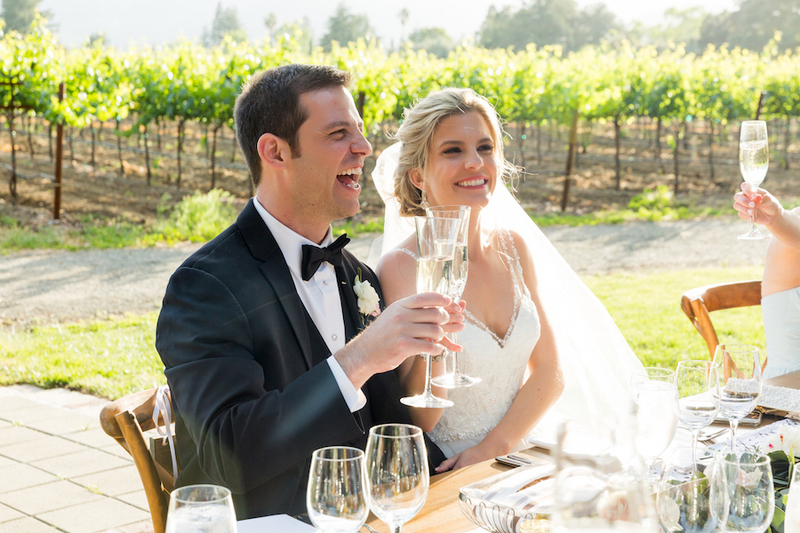 The proposal was set in Napa Valley, where we plan to get married, yet she thought we were there just to enjoy time away and look at wedding venues. 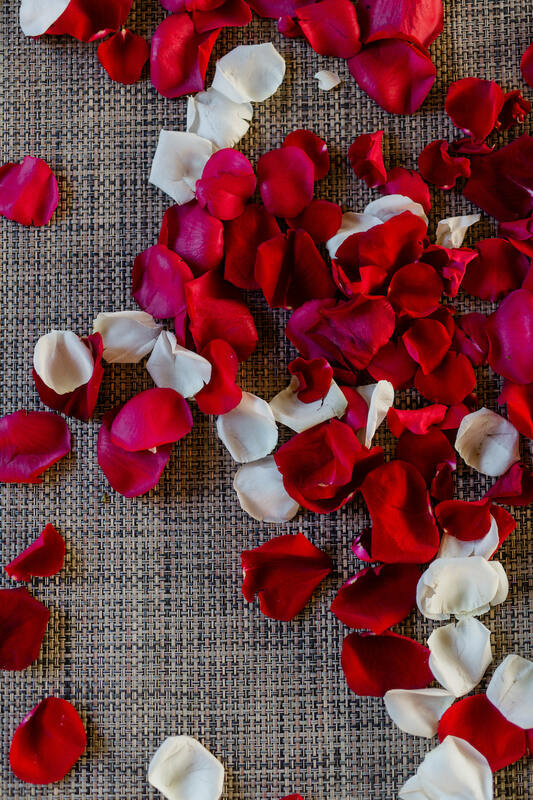 I worked closely with ROQUE Events and the vendors they recommended to make the day perfect, romantic and keep it a complete surprise. We started our day with a wine tasting tour in the morning followed by lunch in downtown St. Helena. After, Ari and I visited The Terraces Winery where we were able to take an ATV tour around the winery and taste their wine with the winemaker, thanks to ROQUE Events and Napa Private Tours. Ari was getting tired during this tour and I began to worry if she was going to make to dinner without being too tired. As we walk up to the spot I kept her distracted by drawing attention to a sculpture that we argued whether it was an elk or a moose or a something else. 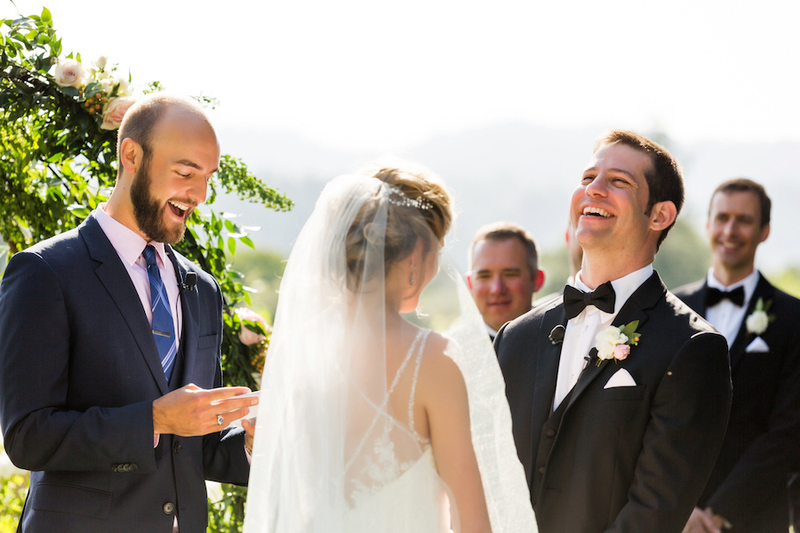 Until she finally saw the balloons that spelled our Will You Marry Me” and even then she thought we were walking into someone else’s proposal. 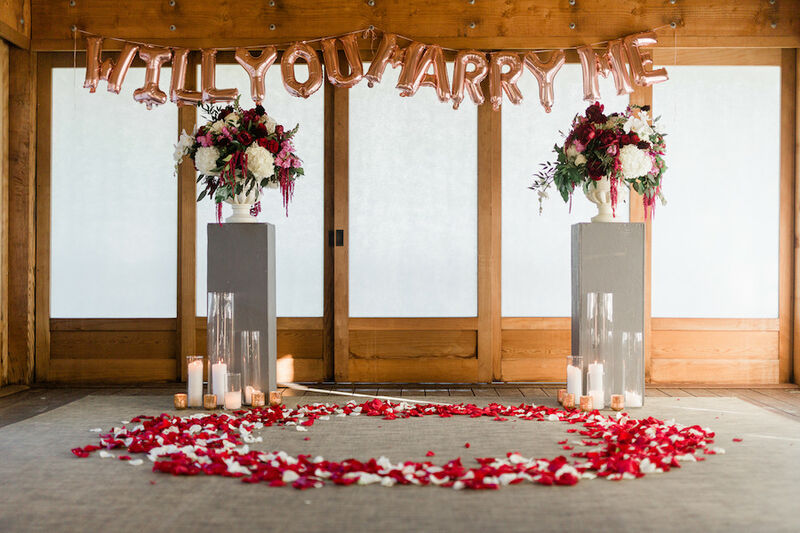 EV Floral filled the room with rose petals and beautiful arrangements under the balloon sign. 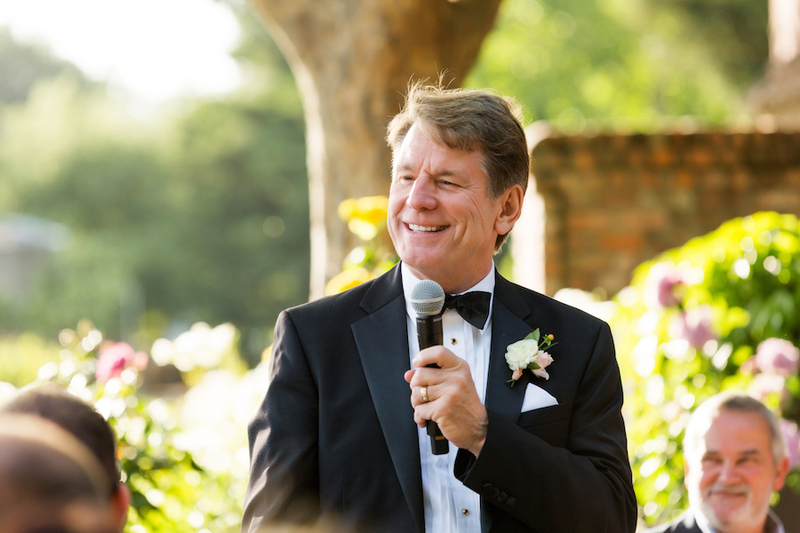 Once I finally got her inside, I got so nervous I got on one knee and tried to recite my lines I had practiced, rethought, and rewrote a thousand times. 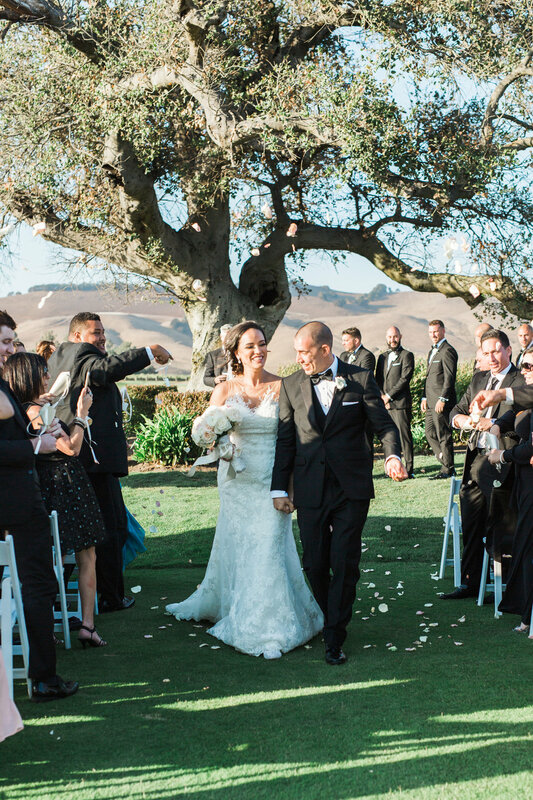 The moment was perfect, she had no idea, looked stunning and the setting couldn’t have been better. Christina from c.m. 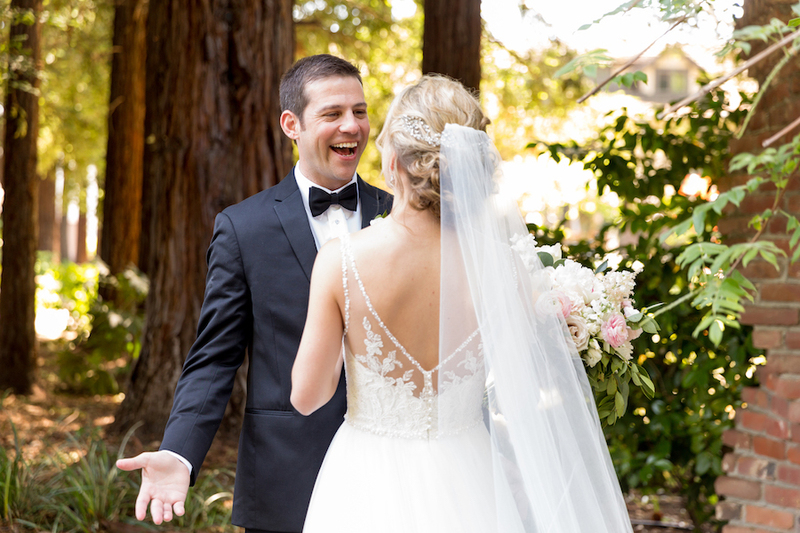 elle studios was hiding behind the trees to capture the special moment! 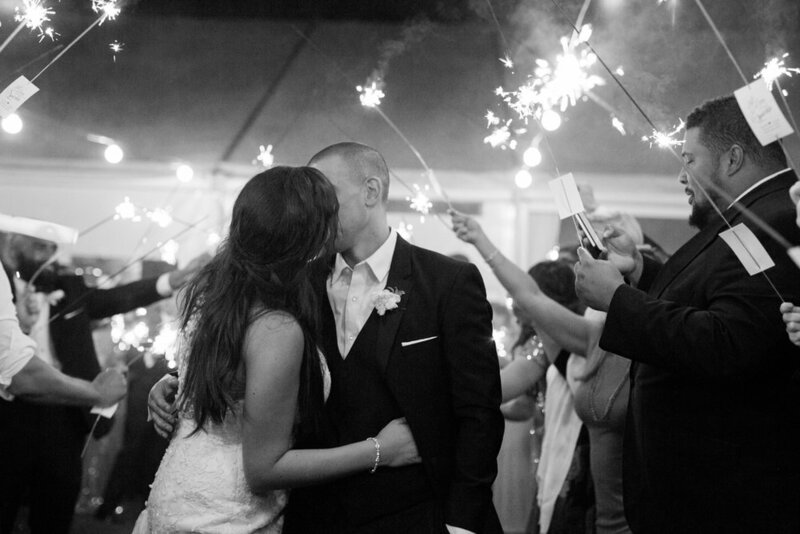 A special thank you to everyone who made that day so special for us and one we will never forget! 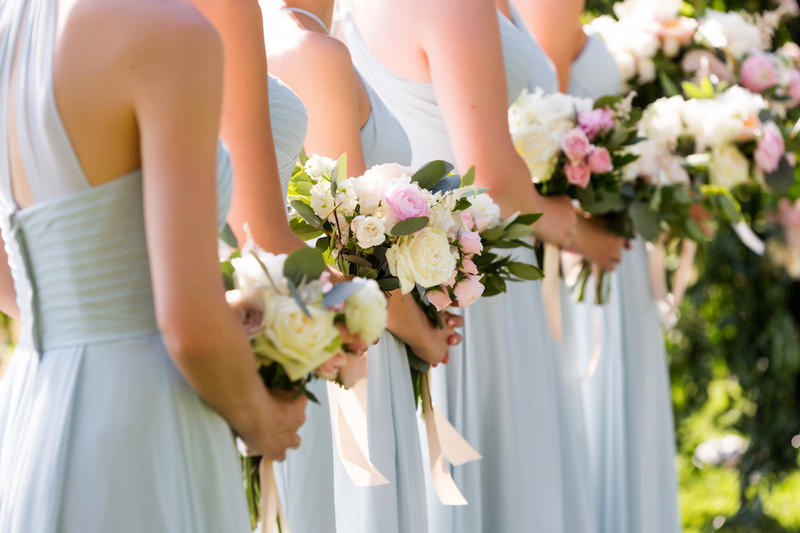 Raquel and Carly of ROQUE Events were such a huge help and I could not have pulled that off without them! 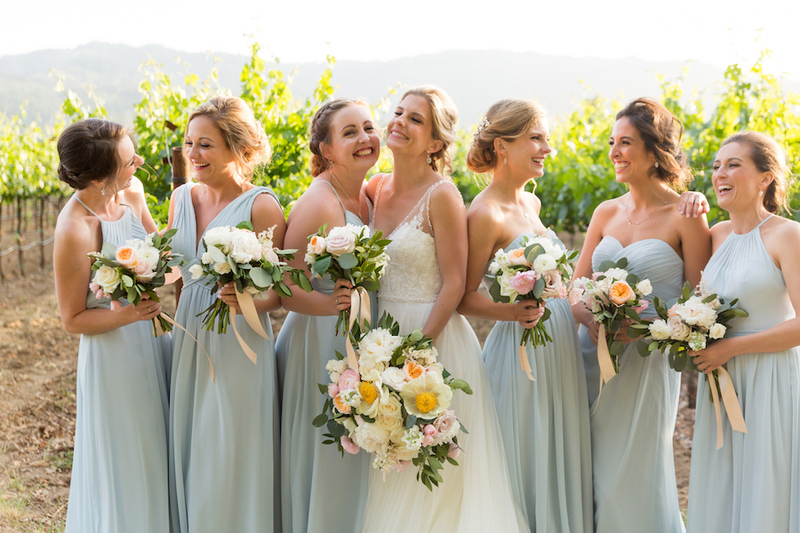 Stephanie + Bryan's summer wedding was truly spectacular at Calistoga Ranch. 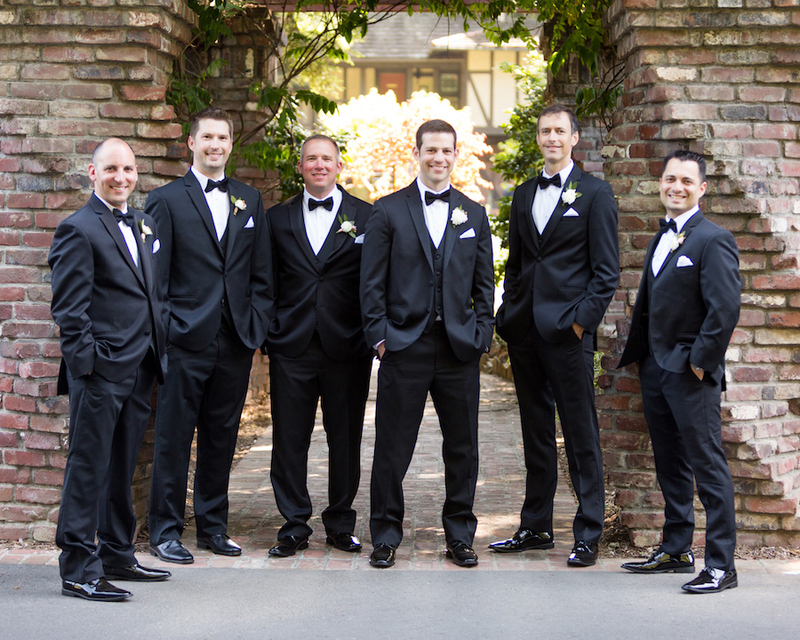 We teamed up with incredibly talented vendors to make this beautiful day a success. 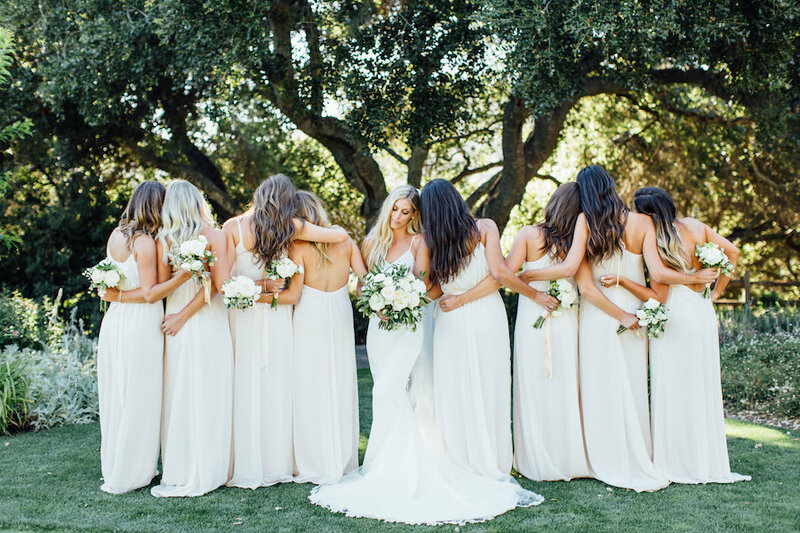 You will not want to stop looking at these pictures... we haven't! Stephanie Tan and Bryan Lo were married on April 30, 2017. 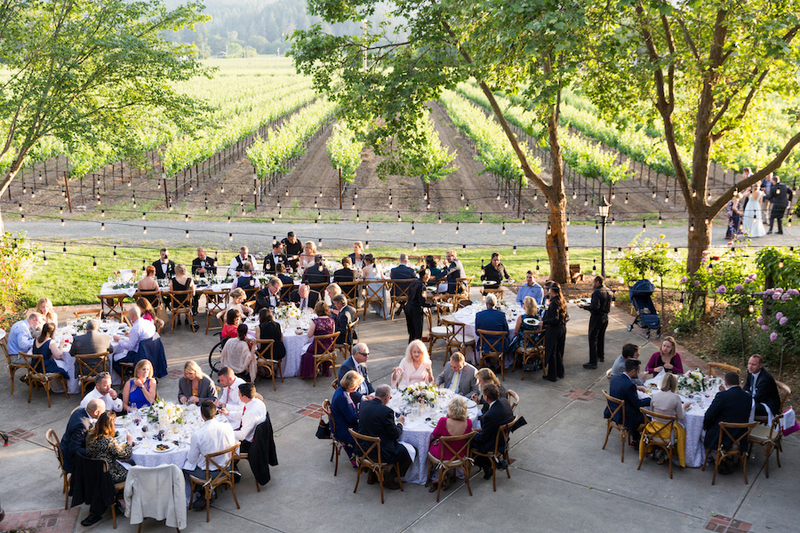 The gorgeous surroundings and nature at Calistoga Ranch are unmatched. 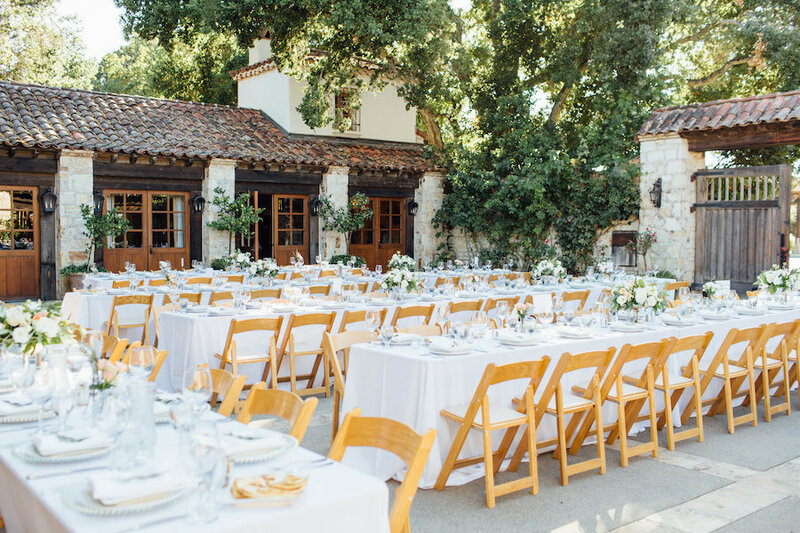 Calistoga Ranch is the ultimate expression of the Napa Valley experience and this wedding expressed Napa best with its rustic, chic, elegant and romantic vibe. 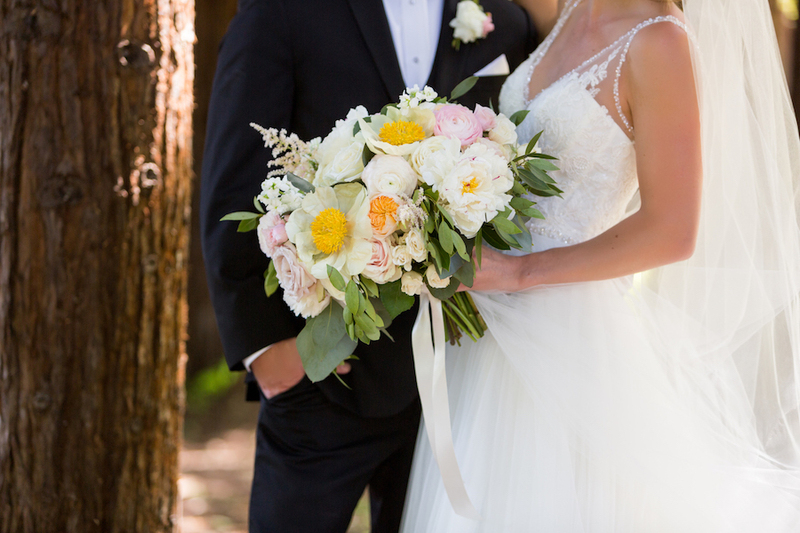 With a simple color palette of white florals and greenery, we designed and executed a beautiful and flawless wedding from beginning to end. 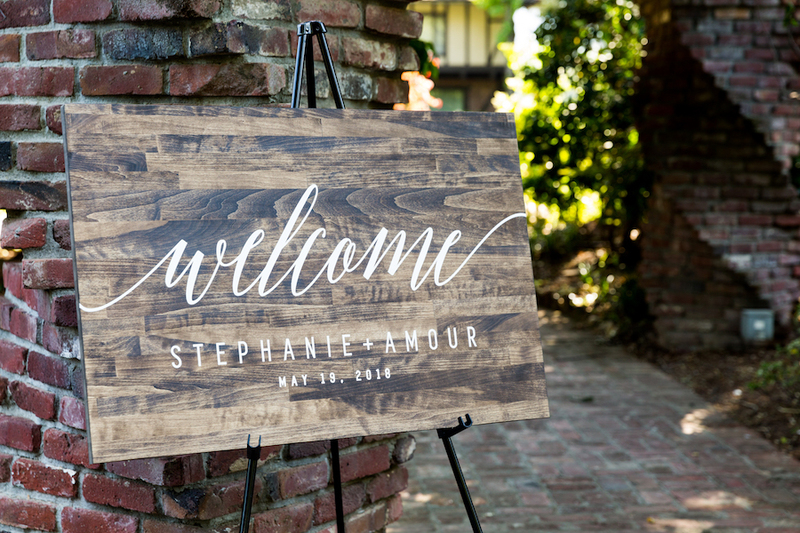 After the nuptials, guests enjoyed a rustic farm table reception we designed. Sounds by Ivy Hill Entertainment played throughout dinner. 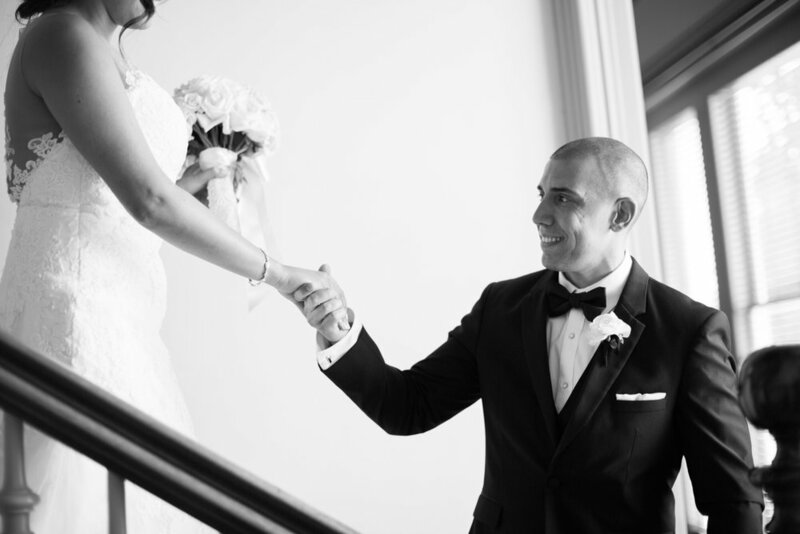 Congratulations to our happy couple and thank you Cinzia Bruschini for capturing the day so beautifully! 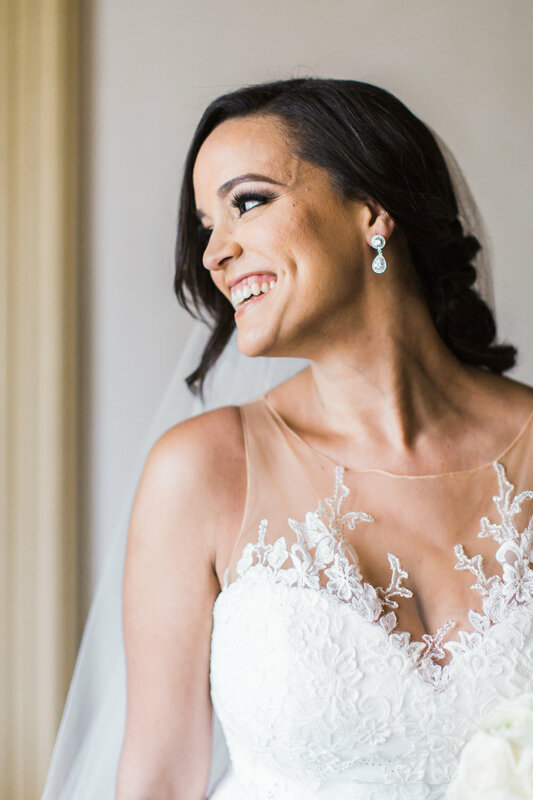 We had the pleasure of working with Jenny + George on their gorgeous wedding at Chardonnay Golf Club. 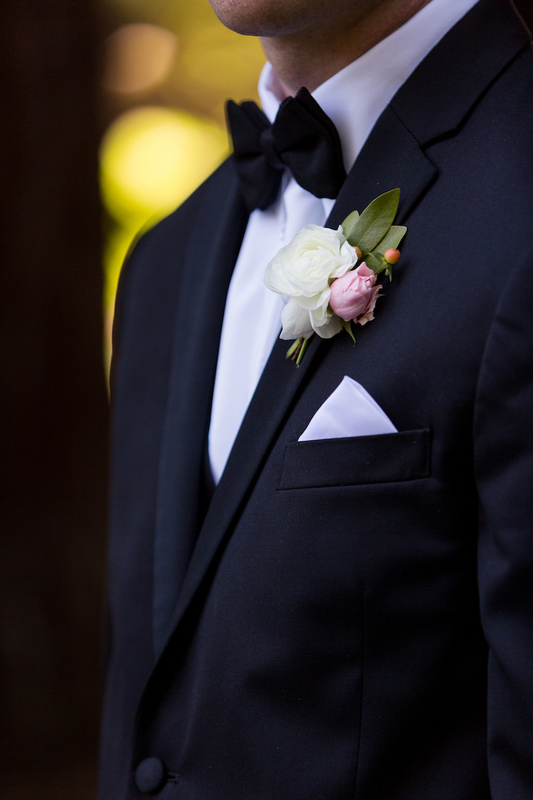 It was such a privilege to coordinate with K Events. 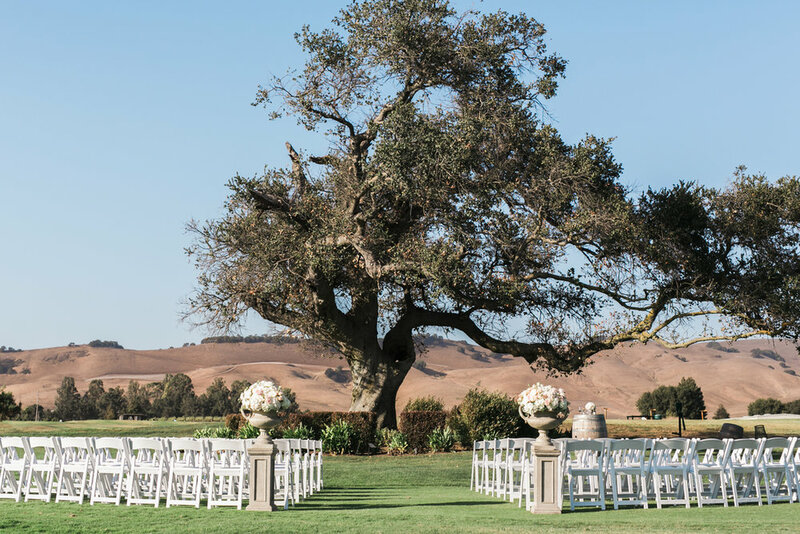 The outdoor reception had the most spectacular view and the couple exchanged vows under a gorgeous tree. 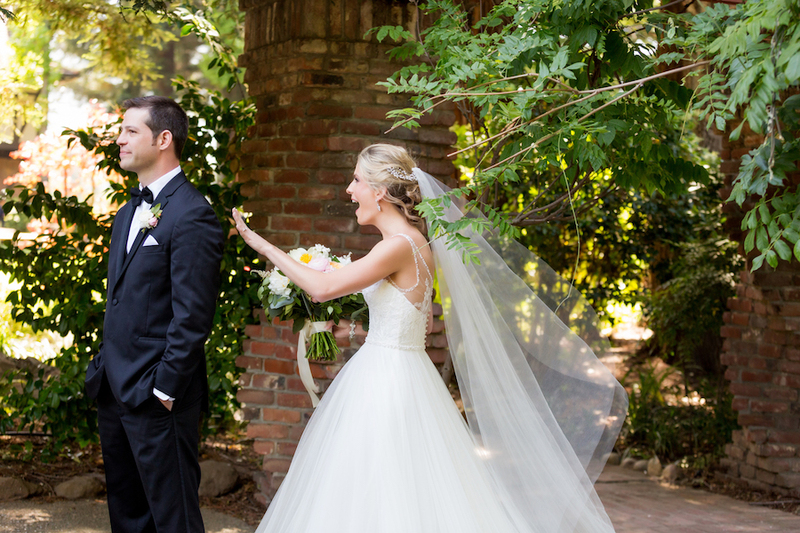 Jenny + George did not take their eyes off each other and we just couldn't seem to either. 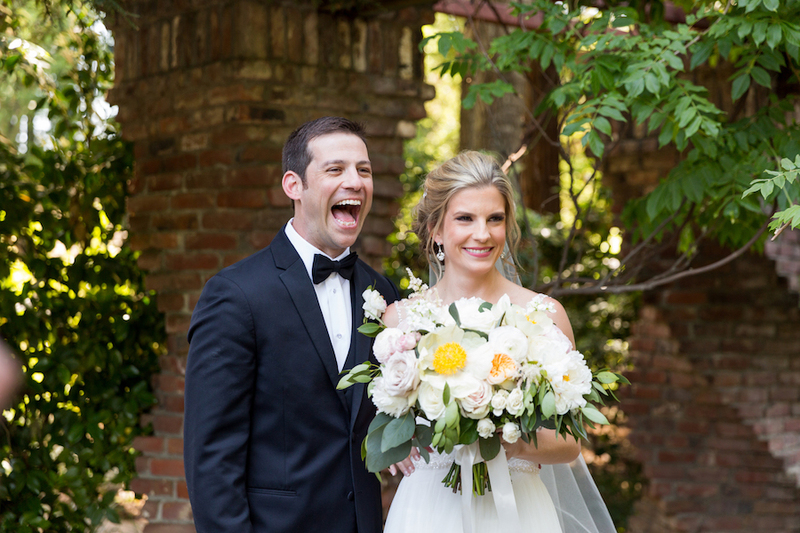 Read their adorable love story below and click HERE to see the full feature on Borrowed and Blue. For college, when I decided to move almost 3,000 miles across the country, George was one of the people who took me to the airport to say a tearful (me of course) goodbye. My friends at Stanford quickly learned of my friend Feet. Through college in California (J), paramedic, EMT school, and fire college (G), and a semester abroad in Spain (J), we talked on the phone all the time. But toward the end of college we began to grow apart, and during law school we barely even spoke. My roommate from Stanford (and one of my beautiful bridesmaids), Wynn, was so surprised to learn when she came to visit me that my new friends at Notre Dame didn't even know about Feet. It wasn't until after law school, that we reconnected. When I moved back home to Miami, I had convinced myself there would never be anything more than friendship between us and it was best we keep our distance, but George somehow snuck his way back into my everyday life and slowly but surely we picked up right where we left off. Thanks to my ACL surgery and my unemployment while I anxiously waited for my bar exam results, in October 2010, I had a lot of free time on my hands. So, George agreed to watch all of the Harry Potter movies with me, leading up to the final one that would come out in November. It turns out that six 3 hour movies was the perfect amount of time to stir up some feelings for both of us. But it wasn't until April 2011 when a "tipsy" George finally told me he wanted to be more than friends. After a full weekend celebrating his 26th Birthday, we finally decided to give this whole "dating thing" a shot. And the rest was history..